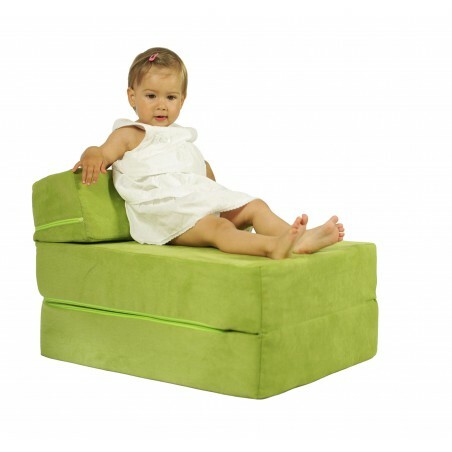 This comfy folding foam sofa has been specially designed for little ones. Suitable for children, but adults use it as well! Made from high density foam, has the perfect balance of softness and gives the proper support. Chair is lightweight and has a handle for easy moving from place to place. Do not contain hard elements. You can choose from many colours options - all of which are guaranteed to brighten up any room. Cover made from soft and lasting fabric provides comfort and unzips for easy cleaning, machine - washable. Give your kids a special place for having fun! height: 43 cm (16,93 in). height: 13 cm (5,12 in). Cover materials: alcantara 95%, polyester, cotton. Cover is washable at 40 °C (104 °F).